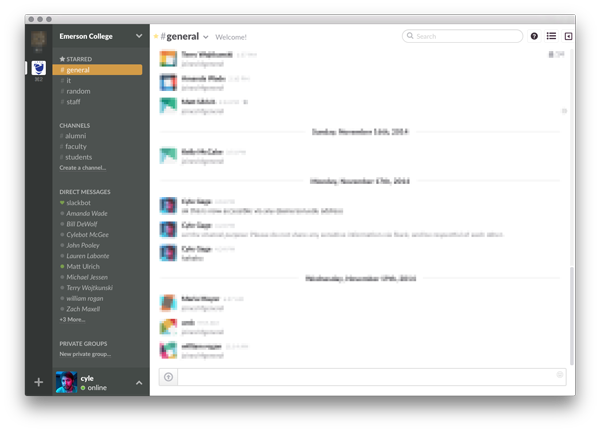 Slack is a chatroom and instant messaging service that is accessible to everyone with an Emerson account. You can create or join public chatrooms (“channels”), create or be invited to private groups, and message individuals directly. For example, everyone auto-joins the "#general" channel when they sign up. Everyone can see and message anyone else in the user list on the left. Slack is a tool that offers help in making inter-office communications easy and efficient. Here are some ways you can use it, and some specific tips for how we use it here at Emerson. You can by visiting emersoncollege.slack.com and creating an account with your Emerson College email address. Note that you must have a working Emerson College email address to sign up and use Slack. One of the great things about Slack is that it is accessible from all types of devices. You can use Slack entirely in your browser (Chrome and Safari are best), or you can download the apps on the Mac App Store, iOS App Store, or Android Google Play Store, or directly from Slack. #general is general Emerson chat for everyone. #random is for random discussion, there is no preset topic. #staff, #faculty, #students, and #alumni are public channels for each of those populations. #it is a public channel for Information Technology. This is a great place to ask IT staff any questions that may come up in your day to day work! Feel free to create a public channel or private group for specific purposes, such as for a department or student organization. 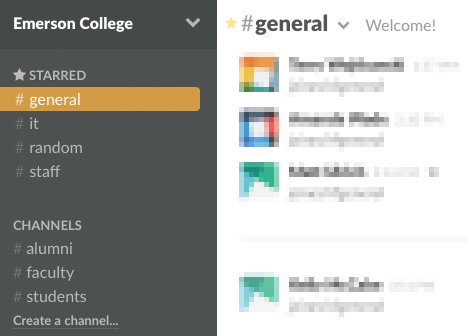 Public channels are accessible to anyone who can log in to Slack. Private groups require the group members to explicitly invite others to be able to view and participate in them. When you create a channel or group, please make sure to set the topic and purpose of the channel or group to make it clear why they exist. You can do this by clicking on the channel or group name at the top of the screen when you are in the channel or group. Since Slack is not hosted by Emerson, please do not share sensitive files or information through it. Use existing services such as Box or your Emerson email to share sensitive files and information. At Emerson, Slack is a professional space with the same social expectations as one would observe in class or in the office. Be respectful of each other and the space you're sharing with others. Please do not use profane or hurtful language. If you would like the attention of one specific person, it's best to message them privately or use the @ symbol before their name (i.e. @cyle) when sending a message to a channel or group they're in. In a group or channel, you can use as many mentions as you'd like in one message if you'd like to get the attention of more than one person at a time. 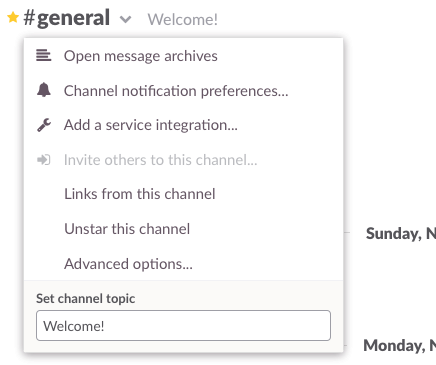 In any channel or group, you can notify everyone at once by adding "@channel" or "@group" to your message. Please do not use this in high-population channels or groups unless it is for emergency purposes. It's much better to mention specific people. Alternatively, you can use @here, which will notify everyone who is a member of the channel and currently active. Use the "away" feature to inform other people of your present availability. You can do this by clicking on your user picture in the lower-left and clicking "Set yourself away" (or "available"). This helps others know whether you're reachable or not for immediate needs. Slack has a wide variety of ways to notify users of message activity. Please take a few minutes to customize your notification options by clicking on your user picture and clicking on "Preferences" and selecting the "Notifications" tab. If you are a part of more than one team, each team has separate preferences. Please update your user profile picture so that others can visually identify you. We encourage you to use a simple, professional photo of yourself. Slack has a huge amount of helpful keyboard shortcuts and commands that start with the / character. 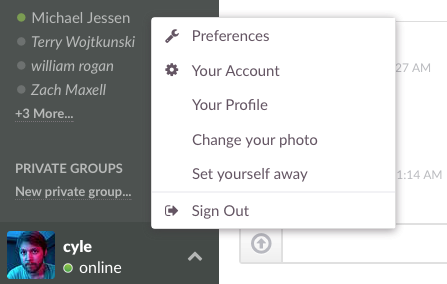 To see keyboard shortcuts, type "/shortcuts" into Slack as a message and hit Enter. You can view a list of /-commands here. Slack updates its browser-based version and its Mac and Mobile apps very frequently. Check the Slack Twitter feed for notices of updates. Slack has an excellent knowledge base of help articles, tips, and other best practices. You can access Slack's built-in help by clicking on the question mark button at the top right. Also, feel free to contact someone in IT to ask questions about Slack — we use it all the time!